The control of a biomass boiler is determined by a few factors. The buffer vessel / thermal store state, full/charged or empty/discharged. Progressive control (multiple sensors that monitor the state of the thermal store buffer vessel as it charges and discharges). The preferable choice would be option 2, where the system is aware of the state of discharge of the thermal store and will fire the boiler when it knows there is enough time for it to get up to temperature before the buffer vessel fully discharges. Option 1 could result in a latency of the system if the buffer vessel is undersized, as the warm up time of the boiler could breach the discharge time of the buffer vessel so an axillary fossil fuel heating system could be used to fill the gap in supply (increasing costs). The control on the biomass boiler itself will vary from manufacturer to manufacturer and in complexity dependent upon the exact model, but most will have the same basic functions. 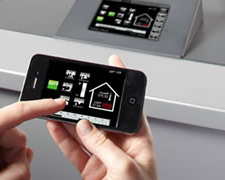 The larger biomass boiler units will have complex on-board computers that allow the system to be fine-tuned to the operator’s exact specifications and some even have the facility to be controlled via your phone or computer. As this functionality differs so much, it is best to check the documentation that accompanies your chosen system for what is available on and for your boiler.